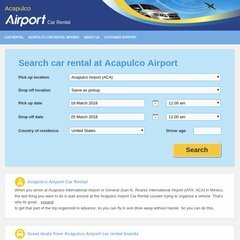 Topics: Car Rental Acapulco Airport, Acapulco Airport Info, Car Rental Brands, Available In The Android Market, Car Rental App, and Acapulco Airport Car Rental Companies. ns2.securebookingpage.com, and ns1.securebookingpage.com are its DNS Nameservers. Webnx California is the location of the nginx server. Its local IP address is 67.220.193.158.